December 14, 2014 – The annual Geminid meteor shower put on a spectacular show for Coloradans along the Front Range Saturday night. 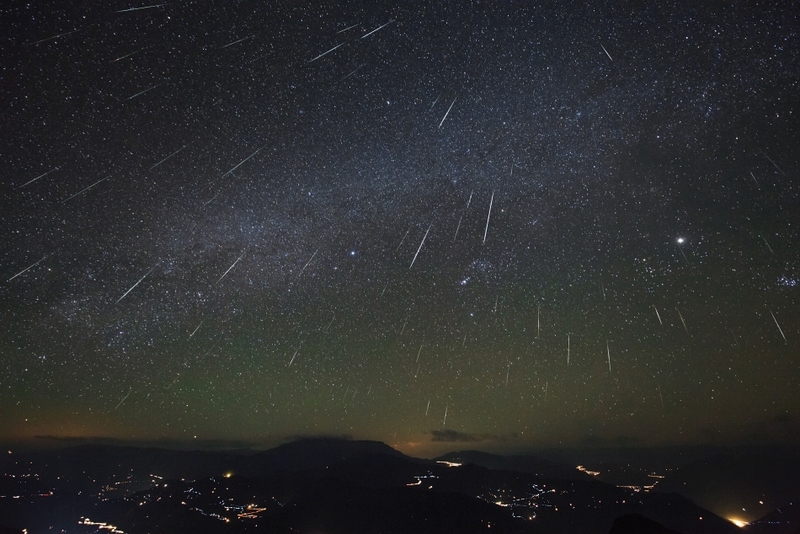 Denver-Boulder residents enjoyed as many as 40-50 meteors per hour during the peak, around 9 to 10 p.m.
Geminids are pieces of debris from an object called 3200 Phaethon. Long thought to be an asteroid, Phaethon is now classified as an extinct comet. Basically, it’s the rocky skeleton of a comet that lost its ice after too many close encounters with the sun. Earth runs into a stream of debris from 3200 Phaethon every year in mid-December, causing meteors to fly from the constellation Gemini. Unlike the Perseids or Leonids, the Geminids are a relatively young meteor shower, with the first reports occurring in the 1830’s citing rates of about 20 per hour. Over the decades, the rates have increased and it’s now the best annual meteor shower with rates between 80-120 per hour at its peak on a clear evening. A team of astronomers led by Dave Jewitt of UCLA have been monitoring 3200 Phaethon using NASA’s twin STEREO probes. They think that intense solar heating blasts the asteroid’s rocky surface, causing 3200 Phaethon to shed meteoroids like embers spitting off a log in a roaring campfire. As the Geminid meteoroids fly out of the constellation Gemini, they hit the top of Earth’s atmosphere traveling about 35 km/s or 78,000 mph. That may sound fast, but it is actually somewhat slow compared to other meteor showers. Geminid meteors tend to be leisurely and bright, producing many fireballs on the nights around the shower’s peak. Despite their bright appearance and long streak, most meteor particles are about the size of a grain of sand and don’t make it very far into the Earth’s atmosphere. Meteor showers are events that are best witnessed with the naked eye, rather than using telescopes and binoculars. It’s generally easier to view them from an area with low light pollution, but last night’s Geminids were so bright that even people in the urban corridor between Denver and Boulder had no problem witnessing them. The Geminids will be visible throughout the week, although weather and moonlight will impact the amount that will be visible. Free public open houses are held on SBO’s observing deck on Friday evenings, weather permitting, throughout the spring, summer and fall semesters, whenever CU-Boulder is in session. In addition to 16-inch and 18-inch telescopes, SBO also has tripod-mounted binoculars and the world’s largest “starwheel” for identifying bright stars and constellations. Most evening programs are hosted by APS department graduate students.